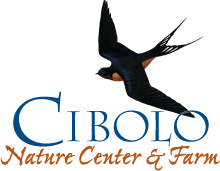 Thank you for your interest in bringing your students out to Cibolo Nature Center & Farm. We would love to have your school out here to learn and have fun with us. Here are a few things you’ll need to know about our Outdoor Classroom program. The cost is $5.00 per student and chaperone. Teachers are free. Our maximum is 65 students per day, so if you plan to bring more students, you’ll need to sign up for multiple days. We offer four 30 minute programs that the students will rotate through each topic, making it two hours of programming. We have a pavilion if you would like your students to bring their lunches and stay and eat after the program. We start programs at 9:30 and finish around 12:00. The entire field trip is outdoors. We do have restrooms available. Program topics we offer are: lifecycles, earth science, adaptations, scientific investigation, biodiversity, habitats, birds, mammals, reptiles, insects, water cycle, water quality, team building, invertebrates, watersheds, pollution, soil, and compassing. Title one schools may qualify for scholarships to help with the cost of the trip. For more information, contact Shasha McCracken.